Co. Longford: Abbeylara, Castle Nugent, Clonbroney (2), Columbkill (2), Granard (3), Gelshagh, Lough Gowna (2). Co. Cavan: Drumlumman (2), Mullahoran, Scrabby. Co. Westmeath: Coole, Foyran, Lickbla, Rathowen, Street. The Board also included 7 ex-officio Guardians, making a total of 28. The population falling within the Union at the 1831 census had been 52,152 with Divisions ranging in size from Lickbla (population 1,678) to Granard itself (8,465). The new Granard Union workhouse was erected on a six-acre site at the east of Granard. Designed by the Poor Law Commissioners' architect George Wilkinson, the building followed one of his standard design to accommodate 600 inmates. Its construction cost £5,925 plus £1,225 for fittings etc. The workhouse was declared fit for the reception of paupers on 15th August 1842 and received its first admissions on 30th September. Its location and layout are shown on the 1914 map below. The buildings appear to have broadly followed Wilkinson's typical layout. An entrance and administrative block at the south contained a porter's room and waiting room at the centre with the Guardians' board room on the first floor above. Additional school blocks were later added at each side of the entrance block. During the famine in the mid 1840s, a 40-bed fever hospital was erected at the north of the main building. Accommodation for an extra 48 inmates was provided in the workhouse turf-house, straw-house and sheds, and in newly erected sleeping galleries. In 1896, Patrick O'Beirne was appointed Master of the workhouse. Also from around this time, nuns from the Sisters of Mercy began providing nursing care in the workhouse infirmary and also taught sewing, knitting and cookery in the workhouse school. The workhouse Medical Officer, Dr Kenny, did not get on well with the nuns and in 1903 made a complaint of neglect against them, but they were cleared in an official inquiry by the Local Government Board. As a result, the disgruntled Dr Kenny was increasingly absent from the workhouse. In June, 1903, a Dr JH Maguire arrived at the workhouse, claiming to be a locum for Dr Kenny who was away at the time. After one of the inmates treated by Maguire died, his credentials were called into question. In another official inquiry, Maguire's visit to the workhouse was said to have been part of a plot to discredit Dr Kenny. However, the Local Government Board decided that the master, Patrick O'Beirne, was to blame for having failed to check up upon Maguire and ordered his dismissal. The Granard Board of Guardians, who were very happy with O'Beirne, refused to accept this verdict and there followed several months of wrangling with the LGB over his dismissal and entitlement to a pension. Eventually, in March 1904, the situation was finally resolved when O'Beirne was declared to be "incapacitated by ill health" and given an honourable retirement with a pension and a collection amounting to £60 from local well-wishers. The Granard workhouse was closed in around 1922 with inmates being transferred to the workhouses in Cavan and Longford, the latter later becoming known as The County Home. After the Granard Workhouse was broken up, my Mother's family continued to live there for about another 10 years, with the Brady family "having the run of the place". At that point (circa 1932), her family moved to a farm some three miles away called Coolcor. At the time they moved, the old workhouse building was still functional and locals from Granard would rent out rooms on the workhouse grounds, paying their rent to (I believe) the County Council. Mom does not recall if or when the facility was demolished. 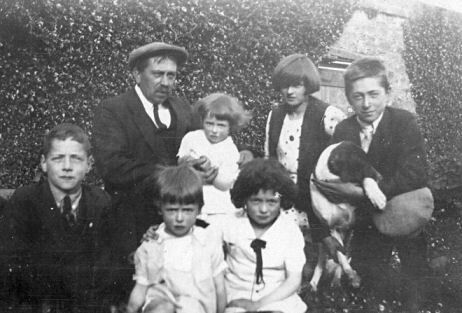 James Brady and family, c.1930. 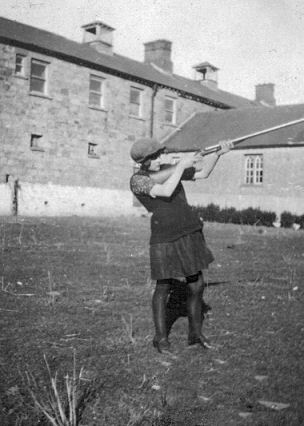 Kieran's mother with workhouse main building and chapel behind, c.1930. 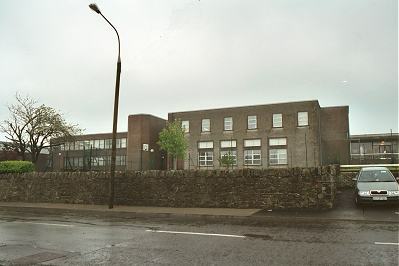 The Granard workhouse buildings have now all been demolished and a school now stands on the site. Longford County Library, Town Centre, Longford, Co.Longford. Holdings include Granard Union minute books (1855-1920, incomplete).